How long could you last inside a room that’s so quiet you can hear your heart beat? 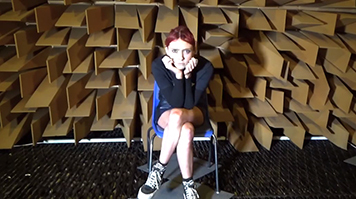 UNILAD took on the challenge at London South Bank University’s (LSBU) Anechoic Chamber, and now hold the unofficial world record! Rio Fredrika, one of UNILAD’s presenters, spent 1 hour and 7 minutes in the chamber, which cuts out over 99% of all sound. She has now spent the longest time in a room of this kind of anyone in the world - the Guinness World Record is held by a journalist who stayed for 45 minutes in the Orfield Laboratories in South Minneapolis, USA. It may sound easy but staying in a chamber with no sound can cause intense headaches, ringing of the ears (an early sign of tinnitus), severe disorientation and, at its worst, panic attacks due to the participant’s belief that the world outside has forgotten about them. With only a chair for company and a camera, Rio had no sense of time in the room and no one to talk to, except herself. After 21 minutes, she reported that she felt the walls starting to close in. At the end of the experiment, Rio did not know if she had beaten the previous record – of course, she was elated to discover she had. The Anechoic chamber is used for simulating idealised conditions for researching a number of acoustic phenomena; sound power determination, sound diffusion coefficient characterisation, binaural recordings, measurement of source directivity, testing of hearing protectors and demonstrating fundamental acoustic principles. Tour the chamber and discover more about LSBU's Acoustic Research Facilities. Almost perfect acoustic isolation is achieved by a "box in a box" construction made of very heavy concrete walls and internal surfaces made of 70cm long foam wedges and large, heavy sound-proof doors. The inner box is mounted on springs to avoid the transmission of vibration from London Underground trains which run underneath the chamber. The suspended floor is made from a metal grill so that heavier equipment, up to 1000 kg, can be measured. This chamber allows sound power levels to be accurately determined, frequency responses to be measured and pure recordings to be made. Recordings can later be processed to create aural simulations of virtual environments. Find out more about LSBU's acoustics courses.